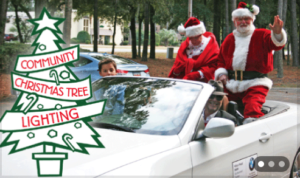 November 24: Community Christmas Tree Lighting, 3:30-5:30 p.m. at the Arts Center Of Coastal Carolina’s Festival Grounds. Santa, Mrs. Claus and their trusty reindeer Rudolph will help kick off the holiday season at the Town’s official Christmas Tree Lighting on the Arts Center festival grounds. It’s an old-fashioned Yuletide celebration complete with Christmas carols, holiday crafts, yummy treats and a musical performance from the cast of “An American in Paris” Look for our Holly Day Art Market and start your holiday shopping early while supporting local artists who will be onsite with jewelry, art, crafts, Christmas treasures and more! Activities for children include face painting, holiday crafts and photo opportunities with Santa. Hot chocolate, coffee, BBQ and other treats will be available to help keep patrons warm. This family friendly community festival is an Island tradition! Free and open to the public – on the Arts Center festival grounds! 14 Shelter Cove Lane. (843) 842-2787 or artshhi.com.